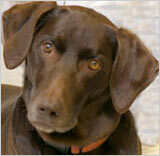 Meet the lovely Cher Burgener, known around town, of course, simply as Cher. The 8 year old Weimeraner and Miniature Australian Shepard mix can often be found greeting clients, and occasionally her frenemy Jake, at N2Therapy on Main Street. You can also find Cher and her caretaker Julie visiting Vic’s many a morning. Make sure to say hi! Built in circa 1896, this house was listed on the National Register in part because it was one of the few Louisville properties retaining its original outbuildings, making it an important example of a late 19th century urban residential complex. Every year we get the opportunity to shine a spotlight on outstanding individuals making a difference in the lives of students. The Impact Awards recognizes individuals in BVSD who have an extraordinary impact on student learning by valuing education, service to students, and leadership. Classroom teachers, specialists, administrators, classified employees, and volunteers are all eligible to be nominated by peers or community members in October. Go to Impact’s website, impactoneducation.org., to complete the nomination form and for further information. Submission deadline is November 2. 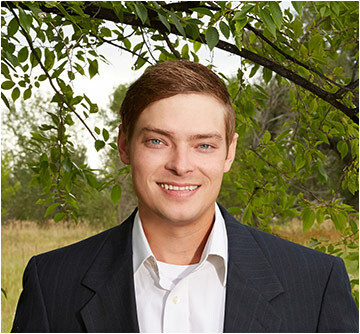 Josh Tribble has joined Trailhead as a Branch Administrator and will be an integral part in the growth of the firm. You may remember Josh from Great Western Bank just two floors below, where he was Branch Manager. Congratulations Josh! To the west side of Main Street that is. 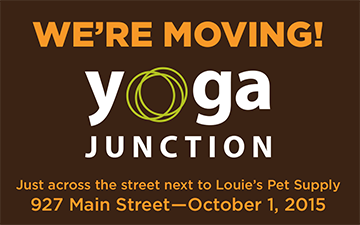 Downtown Louisville’s highly successful yoga studio is moving across the street into the historic remodel at 927 Main in very early October. “I feel very fortunate to not only be able to stay in Downtown Louisville, but also to move into a space that truly captures the small-town setting that we all love,” says Yoga Junction owner Melissa Williams. Williams adds, “The new space features beautiful architectural features, natural light and has a very calming feel. I can’t wait to welcome students into the new Yoga Junction!” 927’s pre-remodel occupant, Zaremba Graphic + Web Solutions, will be staying in their new space at 841 Front Street. The first of these exciting events is part of the Sunday Classic Series. 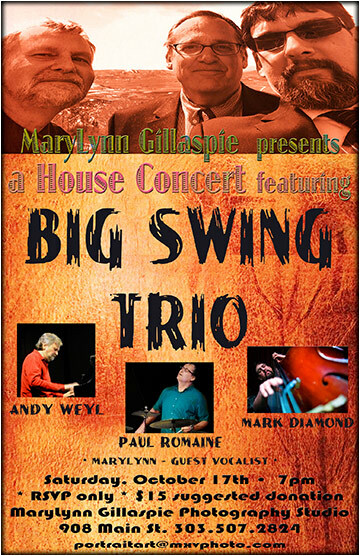 Jim Baley will be featured as a solo guitarist and in a guitar and cello duet. The program begins at 3:00 pm on Sunday, October 11. 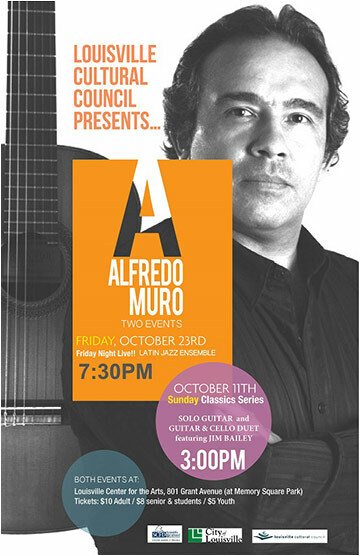 The second concert features Alfredo Muro and his Latin jazz ensemble, on October 23 at 7:30 pm. Tickets are $10 for adults, $8 for seniors and students and $5 for youth. Bella Frida will be celebrating Día de los Muertos, or Day of the Dead, the month of October leading up to the actual celebration on November 1 and 2. Day of the Dead is a time where loved ones who have passed away are remembered and honored. 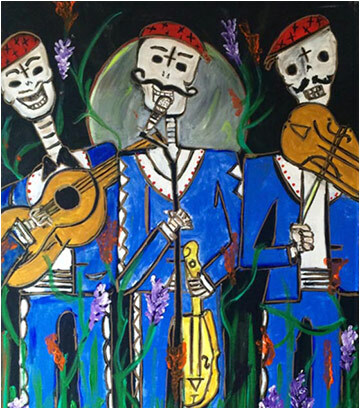 Local artist BriAnne Berg has captured the essence with her playful skeleton paintings and will be featured at the store. Other special events are planned for the month including art classes, face paintings and a Community Altar. Check out the website for more details. Are you or someone you know in need of something different to help you achieve your physical goals? Are you someone who isn’t necessarily in pain but you know you aren’t living up to your physical potential? Are you suffering from a nagging injury or pain and are tired of the negative affects of pain meds? Do you know the difference between HEALTH CARE and SICKNESS CARE? Dr. Biggs will review ways that chiropractic can assist in the wellness treatment to create synergy between you, the patient, and the doctor. This is done mainly through nutrition and a good physical routine in addition to regular adjustments, which in all will help to ensure optimal position and function. Attendees will receive a complimentary gift. This spectacular jewelry line from Madrid, is created from silver plated metal alloy and is rapidly gaining popularity all over the U.S. By Chance is the only Louisville retailer carrying the line. Don’t miss this opportunity to see this beautiful work and start your holiday shopping! Are you prepared for Small Business Saturday in November? You might want to attend the Small Business Basics class, a marketing and business training workshop to provide you with tools and easy strategies to get the word out about your business and drive customers to your door! For more information go to marketingjava.com/sbb or call 303-900-3387. FingerPlay Studio will host Michele Lasker during the October Art Walk. 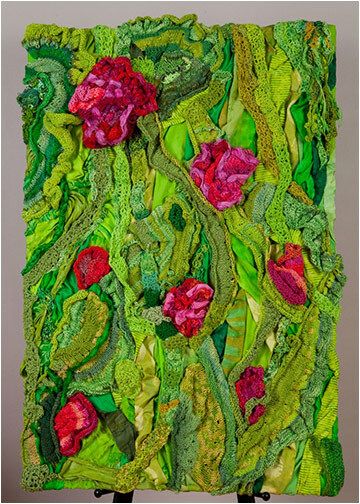 Coming from Oklahoma, Michele is a fibre artist who uses knit, crochet and digitally printed fabrics to create art inspired by nature. Take a workshop with Michele at FingerPlay studio on Sunday, October 4, 10:00-4:00 to collaborate and create a scarf or shawl with the artist. Workshop is $60, materials not included. Gather resources and tips to jump the hurdles of dyslexia, address barriers in the workplace, and learn about assistive technologies available for people with learning differences and other disabilities. The workshop is presented by Jane McKean, career counselor, and Cindy Kalman, MFA, board member, Rocky Mountain Branch of the International Dyslexia Association. 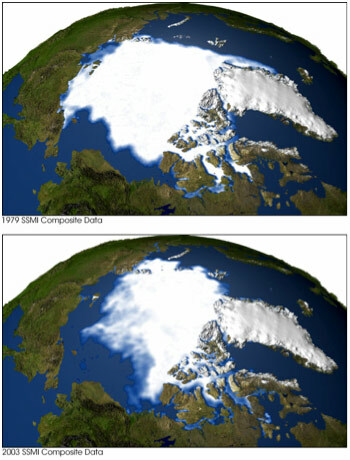 Waleed Abdalati, Director, Cooperative Institute for Research in Environmental Sciences (CIRES) at CU, and formerly a scientist with NASA, will share what he has learned from his research about how and why the Earth’s ice cover has changed, and what that means for our life on Earth. Recommended for ages 12 and up. Gather up the family for an evening of stargazing at Louisville Community Park. Experts from the Longmont Astronomical Society will bring special equipment, and help us all see exciting celestial objects. LAS will kick things off with a brief talk at 6:30 pm followed by a viewing party from 7:00 – 8:30 pm. All ages are welcome! Drop in and stay as long as you like! November is National Novel Writing Month (NANOWRIMO). Would you like to give it a try? Need some encouragement to get started and stay the course? Award-winning local author, Rachel Weaver will offer insight into how to get started on your novel, what to expect during NANOWRIMO, and how to move forward after a month of furious writing. Recommended for ages 12 and up. As part of the First Friday Art Walk chats, the Historic Museum will talk crime this month, specifically, crimes that took place in Louisville’s saloon culture, as well as other wrongdoings. Be sure and catch these spooky stories, presented regularly during the two hours.